Stuck in trains for hours yesterday, I was revisiting favourite passages from The Lord of the Rings. It’s almost a cliche to say that every re-reading rewards you with new details of Tolkien’s invented world that you hadn’t quite noticed or paid much attention to before, but I think it reflects the experience of most Tolkien fans I’ve ever met. Apart from cultures, languages and histories, Middle-earth is rich with allusions to stories untold, or half-told, or just about glimpsed, like tiny shiny threads in an enormous canvas. And – perhaps because it’s Valentine’s day today – I was suddenly struck by the word “lover” in Book II, Chapter 6 in The Fellowship of the Ring. Not a word Tolkien uses a lot. So I paid special attention to the story it comes in, the story of Nimrodel and Amroth, as told and sang by Legolas. In the 1960s Tolkien developed this story, which was posthumously published in Unfinished Tales, but in The Lord of the Rings, we only get glimpses of a legend of two lovers who became inadvertently separated and united only in spirit. Or perhaps in sound and in water? The occasion on which Legolas comes to partly-tell, partly-sing the story of Nimrodel is when the members of the fellowship reach and cross the stream that bears the same name. By a waterfall, “Frodo fancied that he could hear a voice singing, mingled with the sound of the water”. But in the spring when the wind is in the new leaves the echo of her voice may still be heard by the falls that bear her name. And when the wind is in the South the voice of Amroth comes up from the sea; for Nimrodel flows into Silverlode, that Elves call Celebrant, and Celebrant into Anduin the Great, and Anduin flows into the Bay of Belfalas whence the Elves of Lórien set sail. But neither Nimrodel nor Amroth came ever back. Now this part of the story echoes a number of other mythical tales, mostly from the classical world. I must have read this story in The Lord of the Rings more than twenty times in the past, but I was only now suddenly struck by its similarity to the story of the nymph Arethusa and the river-God Alpheus. The story is alluded to or told more fully many times in Greek and Latin texts by Pindar, Strabo, Pausanias, Virgil and Ovid. It is one of numerous stories of an amorous God pursuing an unwilling nymph in classical literature (e.g. Apollo and Daphne). Arethusa was a Naiad (a river nymph) who was pursued by Alpheus, the God of the eponymous river (which still flows in the Peloponnese in Greece). 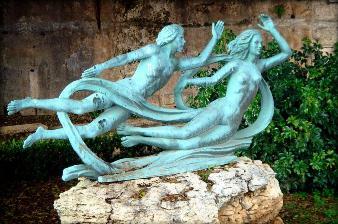 She fled to Sicily were she was turned into a steam to escape him, but he directed his water across the sea towards the west to reach her and mingle his waters with hers. Now clearly this isn’t quite the romantic love story – indeed, most art that depicts this story shows clearly Arethusa’s distress as she tries to flee Alpheus, but the story was often told in more romantic terms in numerous retellings of Greek myths in the Victorian period. The part I think Tolkien may be (consciously or unconsciously) echoing is how the lovers are united after having gone through a sort of transformation (metamorphosis). We are never told that Nimrodel was transformed into a stream, but she is identified with one, while it’s unclear whether Amroth was drowned in the sea, or somehow found his way back to his lover in a transformed state. Their voices, though, united in those rare times in the spring “when the wind is in the new leaves”, are carried by the waters, as Nimrodel’s waters head towards the Bay of Belfalas and to the sea in which Amroth dived to get back to her. I wonder how many other little love stories and allusions to mythological tales I am still to find in Tolkien’s legendarium? Lovely story! Thanks for highlighting this glimpse of the tale in Lord of the Rings. I have known the story of Arethusa since I was six and I still can’t believe that I only yesterday put two and two together in the case of Nimrodel! Even Shelley, by the way, stays with the more disturbing aspects of the myth, having poor Arethusa pursued and generally perturbed (to put it mildly) – but Tolkien seems to have been more impressed with the ‘poetic’ potential of the myth – the two lovers united in spirit via water (and echoes).